...the Stetson New Pilot's Fun Fly event! 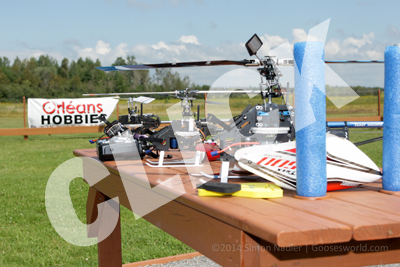 During what was perhaps the last good weather weekend of 2014, 19 pilots registered for the New Pilot's Fun Fly event. Pilot's and instructors from the last five years of Flight School arrived with many aircraft of all types for an excellent day of flying, friends, family and food. Many thanks to the volunteers Hal, Sue and Maurice who put on a great BBQ lunch and kept everyone hydrated. Stetson Flight School will resume in May of 2015 for it's sixth year of successful operation. Endless thanks to the instructors, assistants and executive for your support of the program. 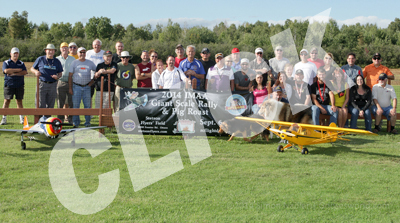 ...the Stetson Giant Scale Fun Fly and Pig Roast event! As you will see from the pictures, the weather gods frowned upon Scott Clarke and his crew with rain, thunderclouds down to the ground and occasional bursts of lightning. The crew started and worked well on into the rain to ensure the pig was ready for dinner as pilots, support crews and eventually the public gathered under the shelter. By lunchtime Saturday the weather had broken and Pierre was the first to fly followed by many others. The roast pig dinner was an excellent success as always and everyone had a huge feed. 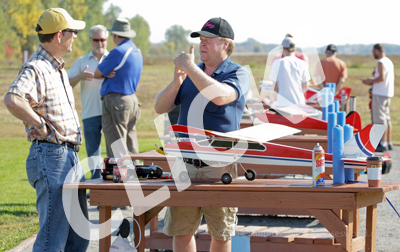 Sunday's weather was perfect and featured tons of great aircraft, flying, friends and fun!. Pictures :Goose. Larger, more & high resolutions available here. 20+ registered pilots attended with many types and sizes of rotary winged aircraft present including electric, nitro and jet powered craft. There were plenty of spectators who enjoyed a great day despite the wind which earlier threatened the event. Congratulations to all who participated, the many volunteers who always make our events successful, family and friends. Pictures :Goose. Larger, high resolutions available here. ...the annual Stetson IMAC event! 26 registered IMAC pilots started arriving on Thursday evening, from as far away as Sept Iles, Chatham, and Sudbury, and all points in-between. A liberal dose of Stetson Flyers ensured we were represented well as a club. Arnprior and Rideau Flyers, and the ORCC were also present, so we had a good cross-section of the local community represented. Congratulations go out to ALL the Stetsons who practiced hard, flew well, and competed most honorably in this year's event. We dominated the BASIC class, managed third in Sportsman, and flew EVERY round without fail. THAT in itself is a testament to the excellent preparation and work of our Stetsons. These Guys are GOOD! The weather was VERY windy, to the point that we stopped flying by 2:30 PM on Saturday at +40 km/hr winds, and the same thing on Sunday. Nevertheless, three full rounds (6 sequences) were flown by all, plus one round of the dreaded Unknowns early Sunday morning. 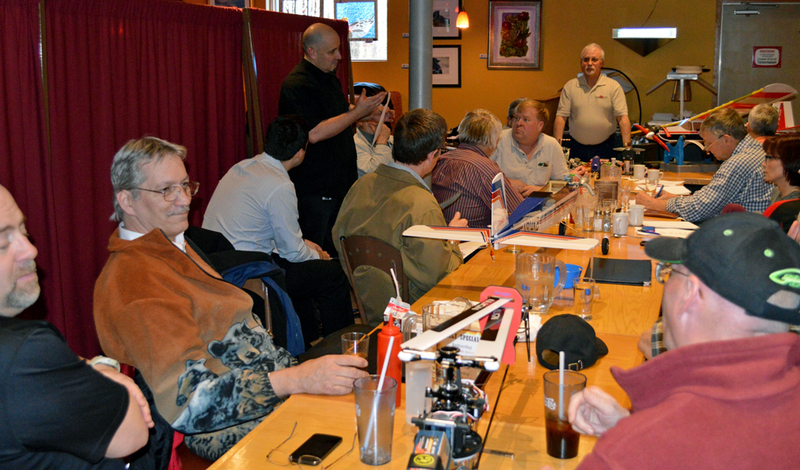 Saturday evening saw 27 people gather at D&S Barbecue for the Pilots Dinner and a very relaxing social evening. Many Ribs and Chickens were consumed, along with a libation or two. It was great to have several significant others, wives and family members join in the dinner festivities. Also evident were the ever-present IMAC Stick Planes, as the gang worked on the unknown sequences for the next morning. It's amazing how flying an unknown in the AM focuses a bunch of pilots out for a good time on a Saturday Night! A very much deserved special award was presented to Pierre Menard for his exemplary sportsmanship during the event. Within 10 minutes of Norm Belair's Extra 300 expiry date becoming crystal clear, Pierre had Norm lined up with his BIG 100 inch monster as a replacement loaner. Pierre went out on the line with Norm and provided intensive coaching as Norm flew his rounds "Cold Turkey"with the big plane. THAT is what it's all about folks; helping each other! Great job Pierre and Norm! Stetsons presented the IMAC Worlds Team Canada Captain Ivan Kristensen, with a special Best Wishes and Good Luck certificate to take with them to the Worlds in Muncie, Indianna, Sept. 2-6, 2014. We will be cheering them on! We wish to acknowledge and thank President Dan Marcotte once again for his tireless efforts on our behalf in organizing and running the canteen, sound system, and virtually everything happening at the event except the flying! A big shout out also goes to the many volunteers who helped in the canteen, in the scoring shack, on the flight line, and in the background running errands and taking care of the many things that have to happen to create a successful event. We really can not do these events without you. THANKS! ...the annual Ed Rae Memorial Fun Fly! An army of volunteers assisted Dan and the executive to another very successful two-day event! 46 pilots decended on the weekend that saw the temperatures reach 29C and 94% humidity. There were many aircraft types represented as you can see from the pictures. Several prizes, people's choice award Saturday Gerry Pronovost, Sunday Don Glandon, limbo Norm Belair and 3D contest Pierre Menard were held through the weekend along with demonstrations and an excellent lunch. Much the same for Sunday with excellent weather, fun and sun! MANY THANKS to all involved! ...the annual Stetson Ground School session! A good number of new & returning students showed up for the annual ground school session as part of Flight School for the 2014 season. There was also strong support from many of our instructors, executive and existing club members. There is a lot of information covered at this session, visually assisted by Hal who brings a model shop worth of equipment, thanks Hal! Nigel prepared a detailed explanation regarding batteries along with a printed hand-out that was well received by all, thank you Nigel! Feedback was positive and students are rearing to go as soon as the field is in a usable condition. Thanks to all who participated to make this a success! ...the annual Stetson Flyers Winter Fun Fly event! 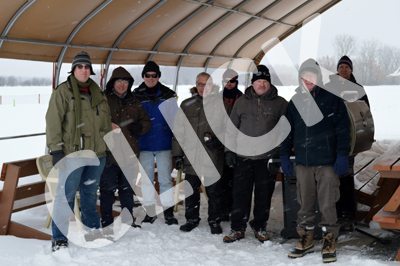 Even with a lot of snow early in the morning, 16 members, 2 visitor pilots from Perth and even a visiting pilot from Timmins showed up at the field for the event. The snow stopped at about 1030 hrs and all the pilots enjoyed perfect winter conditions with almost no wind. No dead sticks and no crashes which made it a perfect flying day. The fire barrel was kept well stocked and our perfect winter shelter with a stunning heater kept us warm between flights. We were also happy to get free coffees in the morning from Casselman McDonalds' restaurant (Thanks Sue for your connection). The Chili was perfect and buns were available for lunch, attending members and guests all had a great time and made for a very enjoyable event. Thanks to all who organized and participated to make this a success! the annual Stetson Flyers first fly event! 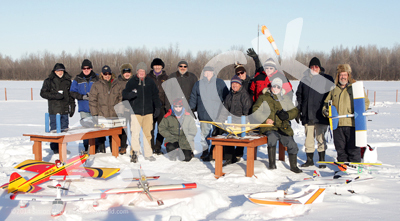 On a VERY cold and bright morning at 9AM, Jan 1, 2014, some 17 certifiably nutty members showed up to participate and cheer on the participants in the First Flight event. With Hal doing the count-down to the 9 AM start, the electric powered herd were all crowding the rails and pit exits to be the first up at the sound of the horn! Unfortunately even the horn froze up and quit, so Hal just had to yell! The electric boys were off in a cloud of snowflakes and electron dust, with Michel Lalonde officially credited with First off! Second was given to John Jackson, and third went to Nigel Chippendale. Well done guys! The Electric Crowd quickly filled the sky and were happily humming around all over the place. Not to be left out of the fun, Pierre Coulombe and Gary Robertson were hard at work trying to coax their glow engines into life. At -21C, that is a challenge! After a few false starts from Gary's trusty OS55, and a lot of grunting and muttering from Pierre as he muscled his Saito 4 stroke alive, it was Gary getting airborne first, followed shortly by Pierre. Gary managed to pull off the first dead-stick after about 5 minutes flying. Turns out the fuel pick-up was so stiff it couldn't follow the fuel... Pierre got a first of the year dose of Murphy's Law, as it turned out he had a bad starter battery...for some reason it objected to -21! Imagine that! Goose submitted his annual offering to the weather gods in the form of a burning sacrifice in the hopes of good weather for the upcoming season. President Dan and the Sue/Hal MacDonald Team were hard at the event preparation. Dan was shoveling snow at 7AM to get ready! Sue and Hal presented trophies and awards to the victors! Lots of good hot Tim Hortons coffee and no-cal(??) donuts provided sustenance in the shelter. Funny how there were many more people IN the shelter than OUT watching the flying...maybe that -30 windchill had something to do with it? Thanks to the organizers for getting us up and away for 2014! Now it's official! The New Year has started!